Are you wondering .... "What size should I order?" ... or ... "How much wall space should I have?" ... or ... simply "Will this piece look good in my house?" ... or ... "Should I order Canvas or a Framed Print?". We often help collectors with such questions. In fact, sometimes they even take a cell phone picture of the wall in question and send it to us and then we can really help make these decisions. If you need any help deciding which would work out best for your location, please contact us and let us help. We're happy to do it and we'd really like for you to be happy with your art selection for many years to come, and of course, there is no obligation for our assistance. It also helps to view examples of art installations to help yourself get an idea of what looks good. 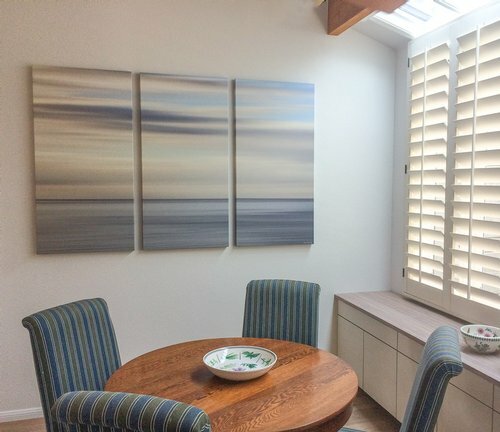 We recommend purusing the website Houzz and we've provided some pics (many taken by owners) of their installations shown here. 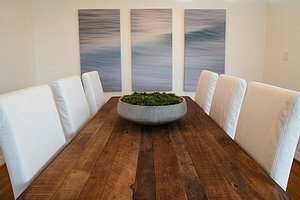 This 76" wide "Soothing Swell" creates a peaceful setting for this dining location. I probably would have placed them closer together but this works too. 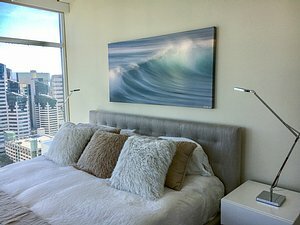 This framed "Light Spray" image is not what it seems. 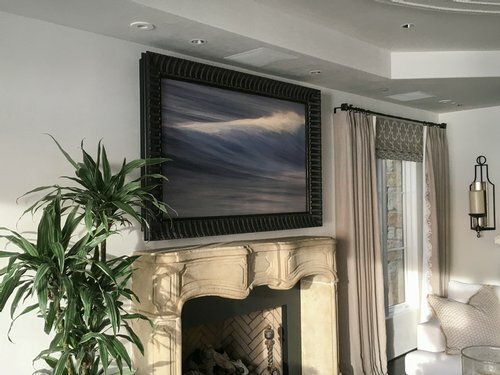 A framed canvas print bringing the feel of the ocean into this living room ... until you want to watch TV and then with a click of the remote, the image rolls up and exposes the 60" TV behind it. A brilliant use of wall space. Carol selected "Morning Light" to go above her bed. I created a piece sized just to what she wanted, 60" x 30". Not only does she enjoy a beautiful downtown skyline, she can also feel the ocean each night before she says goodnight. 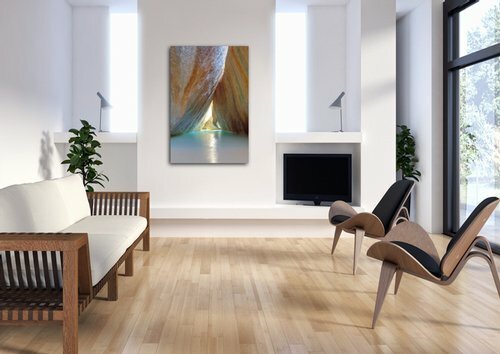 Transforming otherwise stark white walls, the "Resting Giants" piece pulls from the colors of the furniture and flooring to make a cohesive room. Stand along the Resting Giants is an inviting piece, drawing the viewer into the scene. Coupled with the lines of the flooring and arrangement of furniture, you can't help but be pulled into this tranquil scene. 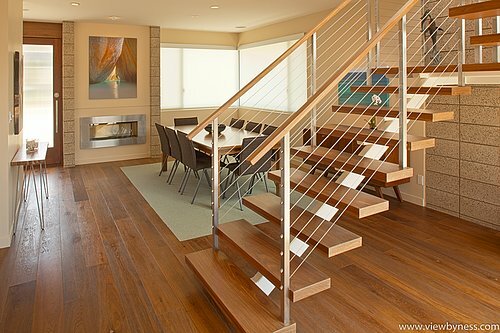 If you could see the kitchen behind the camera, you'd see that this piece, Ocean Mood, pulls together all the colors in this open floor design. Warm grays and browns, and elements of blue all come together in this piece to complete the puzzle. 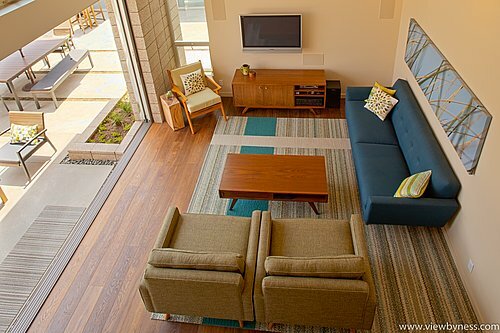 And the 76" wide piece can be seen well from any vantage point in the great room. That was the goal of this couple in a downtown San Diego highrise. 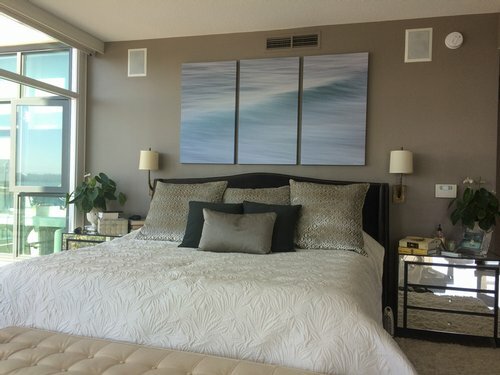 They could see the water from their beautiful condo and they wanted to bring that feeling in. Smooth Swell in a 76" wide triptych did just the trick. The very long shutter speed of this capture let's the consistent flows of water "burn in" to create deep lines of black, gray and light gray. 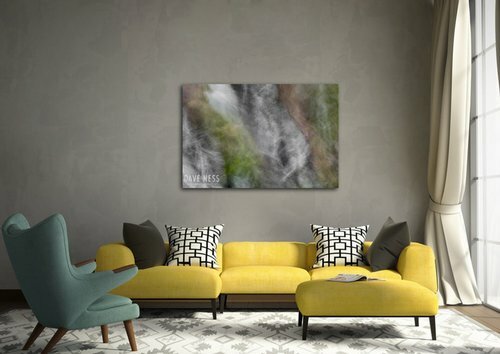 To some an abstract, to others a waterfall, either way, it is a strong backdrop for this well defined interior. 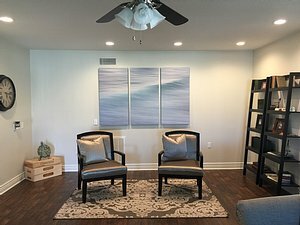 This 48" wide by 24" high "Structured Calm" fits perfectly over the firecplace and is in balance with the scene on this wall. This impressionistic capture, "Energy of the Falls" provides the perfect abstract presence to an otherwise structure setting. Grounded in earth's colors and abstract in nature, this piece further amplifies the modern couches. Jeff and Wendi bought this piece in the morning and sent me the picture of it hanging that afternoon. They did a great job of selection and hanging. This 76" wide by 48" high "Soothing Swell" triptych adds subtle color and energy to the room. 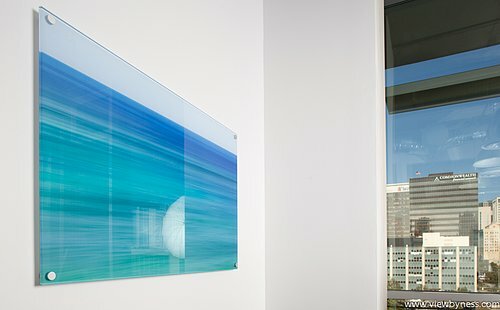 This CEO chose a 48"x32" "The Ocean's Colors" mounted to the back of 1/2" Acrylic for his office wall on the eighth floor of a very modern office space. It complimented the overall look of the office and added just the right amount of wow factor. 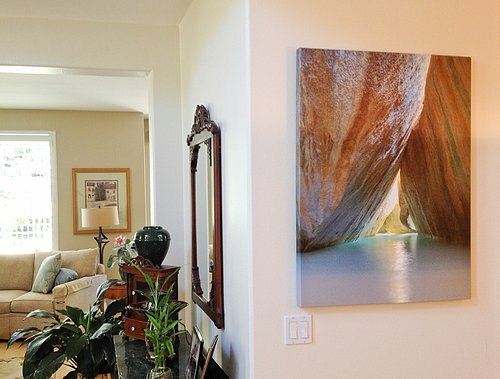 The "Resting Giant's" on canvas was soft enough to fit in this lovely home, yet provided the punch the room needed with the dramatic imagery. Actually mounted to a dining nook wall and adjacent to the living room this piece can be seen as you decend the circular stair case and as you walk in the front door. 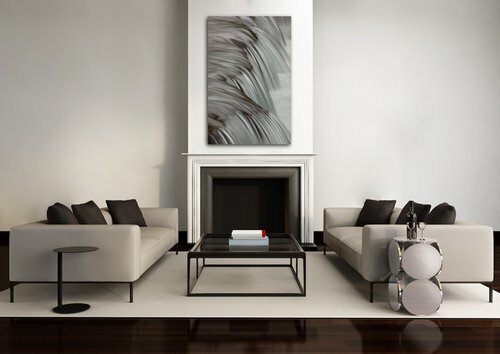 In a modern decor this wide canvas giclee provides a soft backdrop to the midcentury furniture and adds to the sense of the blowing summer winds. 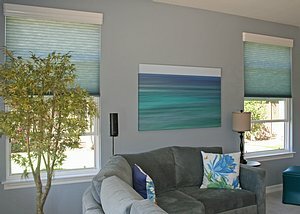 W ith the ocean just a couple of miles away and viewable out the windows, "The Ocean's Colors" brings the color and movement into this living room. 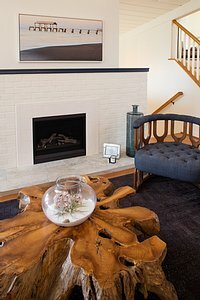 This modern gas fireplace is accented by the "Resting Giant's" on Sintra to give the fireplace the solid presence in the room. A perfect amount of wall space, or "white space" as designers sometimes call it, frames the piece well. 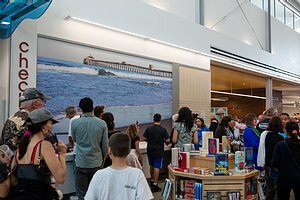 The book checkout kiosks at the new Imperial Beach Library is backdropped with a 15 foot wide mural of the Imperial Beach Pier. I captured this image specifically for this setting. The pier is a composition of seven images stitched together so that when printed this size it is still crisp and clear. Have a Dave Ness image in your location? Send it to us. We post many on our Facebook page for others to see and enjoy.